Ms. Corpuz (in shirt with DSWD logo), SWAD Staff, answer queries from a prospective adoptive parent (in white shirt) at the Adoption Help Desk in SM City Cauayan, Isabela. The launching of the said help desk was in partnership with SM Cares Foundation, among others, and other participating government and non-government organizations. This advocacy seeks to strengthen awareness on legal adoption and continues to warn the public against simulation of birth certificate. “Under the Domestic Adoption Act of 1998, simulation of birth is a criminal offense. It is committed when a person causes the fictitious registration of the birth of a child under the name(s) of a person(s) who is not his/her biological parent(s) and shall be punished by imprisonment of 6 to 12 years and a fine not exceeding Ph50, 000.00,” says Ms. Rosario Corpuz, DSWD Field Office 02 Focal Person for Adoption and Foster Care Services. On the issue of meticulous process of legal adoption such as series of interviews and counselling as a deterrent to adoptive parents, Ms. Corpuz reasoned out that this rigid process seeks to ensure the best interest of the adoptee considering the implications of legal adoption both to the adoptee and the adoptive parents. Legal adoption process involves several steps such as application of interested parents, approval and disapproval of application, preparation of home study report, matching or family selection, pre-placement and placement of child, supervised trial custody, among others. This process would usually take six months to one year. These children are all smiles as they strike a pose with their new toys. 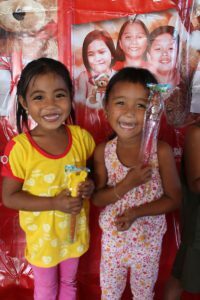 Smiles were painted at the faces of children beneficiaries of the Pantawid Pamilyang Pilipino Program as they receive toys from SM Foundation through their “Share a Toy” program. About 683 children who belong to Indigenous People (IP) group namely Agta, Ibanag, Ayangan, Bugkalot, Kalanguya and Ibaloi from the municipalities of Baggao and Aparri in the province of Cagayan; San Pablo and Sta. Maria in Isabela; Maddela and Nagtipunan in Quirino; and the municipalities of Ambaguio and Alfonso Castañeda in the province of Nueva Vizcaya were given assorted toys ranging from dolls, puzzles, LEGO, cars and musical instruments. “Tuwang-tuwa ako sa doll na natanggap ko. Salamat po sa SM at sa DSWD!,” said Marian Alonzo, five years old, and a children beneficiary in the municipality of Baggao, Cagayan. The toys came from SM City-Cauayan and were turned-over to the Department of Social Welfare and Development Field Office II on January 15, 2015. “These toys will surely give the children joy and laughter,” DSWD Regional Director Remia T. Tapispisan said. Tapispisan also emphasized on the importance of converging with the stakeholders in serving the vulnerable and the disadvantaged. “This program which is dedicated to our children beneficiaries is a perfect example of convergence, as we join our hands to put a smile on their faces,” she added. The Pantawid Pamilya is a human-development program of the national government that invests in the health and education of poor Filipino children aged 0-18 years old. Cash grants are provided to families in exchange of compliance to health and education conditionalities. Parents must also attend the Family Development Sessions. A health professional examines one of the Pantawid beneficiaries during the Medical Mission. About 397 beneficiaries of the Pantawid Pamilyang Pilipino Program from the Province of Cagayan flocked at the gymnasium of the University of Saint Louis Tuguegarao (USLT) for the free medical and dental services relative to the celebration of their 50th Founding Anniversary on February 15, 2015. A battery of health professionals catered to the medical needs of the beneficiaries from the municipalities of Amulung, Iguig, Solana, Piat, Tuao, Tuguegarao and Sta.Ana. “Nagpapasalamat ako at napasama ako upang makinabang sa serbisyong ito”, said Mercedes Canapi, a beneficiary from Amulung, Cagayan. The medical and dental mission was a project of the University of Saint Louis Tuguegarao Alumni Association Inc. (USLTAA) which aimed at providing community services especially to those who are in need. The USLT is one of the many academic institutions in the region which has an active partnership with the Department of Social Welfare and Development Field Office II that gives fulfillment to the agency’s thrust of converging with the different sectors for a more effective and efficient implementation of social protection programs and services. Meanwhile, the Pantawid Pamilya is a human-development program of the national government that invests in the health and education of poor Filipino children aged 0-18 years old. Cash grants are provided to families in exchange of compliance to health and education conditionalities. Parents must also attend the Family Development Sessions. The Local Government Unit (LGU) of Aparri was hailed as the Regional awardee and Second National Place Winner in the first ever Gawad Listahanan Awards given on the occasion of 64th Anniversary of the Department of Social Welfare and Development Field Office II (DSWD-FO2) on February 11, 2015 at Crown Pavillon, Tuguegarao City. Gawad Listahanan Awards is a prestigious competition that recognizes the LGUs who have best utilized the Listahanan Database as their basis in selecting deserving beneficiairies for their social protection programs and services. LGU-Aparri is one of the contenders under the municipal category where the Aid In Crisis Situation (AICs) was their entry in the said competition. Mayor Tumaru thanks DSWD thru the Listahanan for unending support for their municipality. real poor thru the Listahanan. Rest assured that our LGU together with DSWD will remain partners in fighting poverty incidence in our municipality. Mabuhay DSWD!” , Shalimar D. Tumaru, Mayor of Aparri, Cagayan said. Posted on 05 February 2015. They call us the lower class, the twerps, a burden to the government. They dub us dependents, supposedly merely after government doles. They call us the poorest of the poor, the beneficiaries of the Pantawid Pamilyang Pilipino Program (4Ps). Let me tell you people, we are less fortunate but we are not stupid. Yes, we are receiving a certain amount from the government, to alleviate our current situation, which is the program’s primary objective. But, is it really a basis for social discrimination and bullying? I am a 4Ps scholar, one of the beneficiaries of the Expanded Students’ Grant-In-Aid Program for Poverty Alleviation (ESGP-PA), to be particular about it. So, what do you think? I am giving you the freedom to say something about it. Are you one of those judgmental persons or among the rational ones? When I first heard about the opportunity to avail myself of the ESGP-PA, I thought of my dreams becoming possible. It was as if chance had found a deserving student who desired to make a difference in her life, in her family, and in her society. Eventually, I became a lucky grantee. I consider that a significant gift that drew me closer to achieving my aspirations. For me, tuition and other school fees, academic and extracurricular expenses, the purchase of textbooks, the lack of stipend and transportation fare ceased to be constant worries in the pursuit of a college degree. Each grantee is entitled to P30,000 per semester, and that has been making a difference. But, the difference includes social discrimination and bullying. Some fellow students say something to this effect: “Those 4Ps scholars, they already have the scholarship, and they’re also given special treatment.” Those students who belong to well-off families look down on us when they learn that we are ESGP-PA grantees, as though we were unsightly. The worst thing was when, in class, a professor presented his opinion on the program’s “dependency” on the government and how our expenses as grantees were being shouldered by taxpayers including himself, all because of irresponsible parenthood. His opinion just seemed so biased. It appeared that he did not realize: What could this mean, how could this affect, an ESGP-PA grantee in his class? These have happened, not just to me, but also to my fellow 4Ps scholars. It’s like being a 4Ps scholar is a sin, that being less fortunate is a sin. We are not the proponents of this program; we are merely the chosen recipients. I’ve come to think: What if everyone is a 4Ps beneficiary? Will their views still be the same? Will the treatment be just and fair? Why does social hierarchy matter a lot in building a community? Irrationality will never unite a country. This is not all about irresponsible parenthood; this is reality. Poverty is present in the country. We are not building a poverty society. In fact, we strongly want to get out of that status. We strive to lift our families out of poverty and eventually give back to the economy. I feel that I should just shut my mouth whenever they throw gibberish at us and degrade the ESGP-PA. Yet my open mind cannot fathom the fact that those words come from supposedly educated people who should know better than us. It is just a manifestation that someone can be educated but not learned. Still, I extend my thanks to the government for providing a great opportunity for deserving students to complete tertiary-level education. I will focus on the positive goals. We’ll eradicate poverty; we don’t need irrationality. We are less fortunate, but we are not stupid. Written by: Rose J. Bongon, 20, is a third-year IT student at Camarines Sur Polytechnic Colleges. She is associate editor of The Spark (the official CSPC school–community publication) and blogs at https://miraqrose.wordpress.com/. With the aim to determine the social protection programs and services received by the Listahanan poor families, the DSWD FO2’s National Household Targeting System for Poverty Reduction (NHTS-PR) or Listahanan will administer a Consultation Workshop with the data-users on the first quarter of 2015 at Tuguegarao City, Cagayan. Listahanan urges the data-users to submit their data utilization report for the year 2014. Data users from the Local Government Units (LGUs), National Government Agencies (NGAs), and Civil Society Organization (CSOs) are expected to attend in the said workshop. “Their feedback report assures us that they are really helping the real poor. Moreover, it is also one of our Strategic Goals of the Department that poor families identified by Listahanan should receive at least two or more services”, Dir. Remia T. Tapispisan of DSWD said. The said undertaking is also an opportunity for the data users to share their best practices regarding the utilization of the Listahanan database as well as open up their difficulties in coming up with their feedback reports. Dir. Remia Tapispisan led the Pledge of Commitment during the Listahanan Interagency Information Officers’ Forum. Twenty two (22) Information Officers from the National Government Agencies (NGAs) pledged to become advocates of Listahanan thru the Interagency Information Officers’ (IO) Forum on January 16, 2015 at Casa Angela, Tuguegarao City, Cagayan. These Information Officers committed to support all Listahanan activities most specially the fast approaching second round of Family Assessment. Likewise, the participants are expected to integrate Listahanan in their advocacy events. “We would like to extend our appreciation to all the participating agencies for this forum. This only shows the convergence among the National Government Agencies. Thank you so much for being our partners in the implementation of DSWD projects, programs and services”, Director Remia Tapispisan of DSWD FO2, said. This IOs’ forum is one of the preparations of DSWD for the second round of Family Assessment. For the participants to have in-depth understanding of Listahanan, NHTU discussed the Listahanan over-all project cycle as well as the Proxy Means Test topic. Partners from Philhealth, Philipine Information Agency (PIA), Department of Health (DOH), Department of Education (Deped), Technical Education Skills Development Autohority (TESDA), Department of Trade and Industry (DTI) vigorously participated in the said event. Posted on 16 January 2015. IN PHOTO: In the spirit of Convergence. The MRFPI will now conduct Family Development Sessions for the Pantawid beneficiaries in Allacapan, Cagayan. The Department of Social Welfare and Development Field Office II inked a memorandum of agreement with the Moral Recovery Formation Philippines Incorporated (MRFPI) on January 14, 2015 relative to the implementation of the Pantawid Pamilyang Pilipino Program in the municipality of Allacapan, Cagayan. The MRFPI is now connected in DSWD’s four areas of engagement, namely: Gabay, Bantay, Kaagapay and Tulay. As such, they will now take part in the conduct of Family Development, assist in monitoring the compliance of the beneficiaries to the program conditionalities, provide livelihood programs, skills trainings and feeding programs and coordinate and network with other Local Government Units, National Government Agencies and Civil Society Organizations. “This new partnership will pave the way for a better and more efficient implementation of the Pantawid Pamilya,” Maricel Grace L.Gomez, the Regional Program Coordinator said. Gomez also emphasized about the importance of converging with the different sectors which is vital in uplifting the lives of the family beneficiaries. The Allacapan-based CSO was represented by Jesus S. Adolfo, the Regional Chairman and Jonathan I. dela Rosa, the Municipal Chairman, respectively.